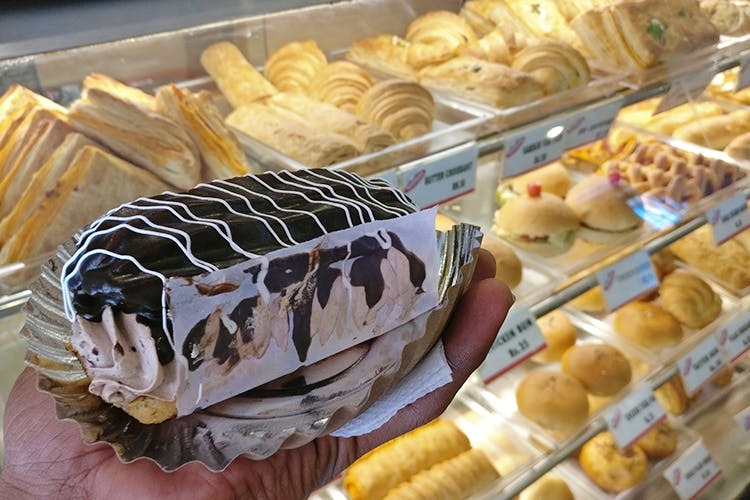 We found yummy bakes, pastries and more at the Winner's Bakery. They also hire underprivileged youth to work at the bakery! Winner’s Bakery on CP Ramaswamy Road has been around for 10 years and of all the bakeries we’ve been to over the years, Winner’s holds a special place in our hearts. The bakery itself doesn’t look like much from the outside, it’s small with no place to sit or wash your hands, but the food and the people at Winner’s are why we love it. Started as a joint venture between the Chennai Corporation, Rotary Club and Chennai Culinary Institute, the bakery hires underprivileged and differently-abled youth to work at their bakery. In exchange, the kids are taught bake and make confectioneries over a six month training period, during which they’re given a stipend, three square meals, optional accommodation and an offer to work full time at Winner’s once their training is completed! The end result is a range of baked goods and confectioneries that are made with a lot of love. Winner’s is known for its very reasonably priced sweet and savory treats. To say that they have the best sellers would mean that there are some products that don’t move fast, which is entirely false. Every evening their entire inventory is cleared by a horde of customers past 4pm, so if you’re going do be sure to go during off-peak hours. If we had to pick our favourites we’d choose the sinfully rich Chocolate Éclair, soft Japanese cake and fresh cream butterscotch pastry. There’s a range of eggless desserts too for vegetarians, with their most-bought being their eggless brownie. They’ve got a savoury section too, with a line up of vegetarian and non-vegetarian puffs, quiches, burgers, croissants and rolls (love the chicken bun!). It doesn’t stop there, they’ve got focaccia bread (with olives for just INR 50! ), buns, breadsticks and snacks too!